For the first five months of the current year, HAROPA Ports, which manages traffic on the River Seine from Le Havre to Paris, encompassing the port of Rouen, handled 5.4mt (million tonnes) of import-export dry bulk. This represented a decrease of 6%, which the organization attributes to a lower than normal demand for coal and building materials. However, for the same five months, cereals traffic rose by 11%, despite the fact that wheat exports were down, due to the specific nature of that crop. Nevertheless, other cereals — wheat for food and barley — more than compensated for this. The Port of Rouen continues to perform well, being the main generator of grain traffic for the HAROPA group. In the 2014/15 season, exports amounted to 7.61mt, up 2.4% compared with 2013/2014 and 14% compared with 2012/2013, giving the port its best two volume totals for exports over the past 15 years. “The bad weather conditions of the 2014 summer had a [negative] impact on the quality of the crop over a large part of Rouen hinterland and led to expectations of a disappointing season. Even the high level of feed wheat handled did not meet the requirements of the Port of Rouen’s traditional milling markets. But the results recorded by Rouen continue their upward trend and helped maintain its leading position,” said a port spokesperson. throughout the north of France. Nevertheless, the 2014-2015 season is being viewed as atypical. Barley traffic, for example, at 1.85mt, was in greater demand than it had been since the 1998-1999 season. Significantly, malt and feed barley shipments to China accounted for 80% of the total tonnage. While Rouen has held onto its traditional export markets for wheat, new markets began to open up. Consignments to the Philippines, Bangladesh,Thailand and South Korea totalled 860,000 tonnes, which is a significant new step for the port. There were also shipments to both Mexico and the United States, which are unusual destinations for the port. There were also a large number of calls – 69 in total – from both Panamax and over-Panamax vessels, which the port stresses shows the ability of the silos to process this type of bulk carrier and justifies the decision by the Port of Rouen to instigate a draught improvement programme, which has included upgrades to the access channel. By doing this, the overall competitiveness of the port has been increased, since river unloading can now take place at the Socomac silo. New maritime loading equipment has also been put in place at Simarex, while river unloading and other investment has been made at Se´nalia, along with the introduction of a dust reduction system and drainage network at Lecureur. Construction of a new port silo has, additionally, been made by Beuzelin. “All this resulted in the 2014-2015 season being the fourth consecutive one in the number of shipments made from the Port of Rouen and strengthens its position as a major grain hub in France and in Europe, despite a complicated season,” noted the port. In addition to the despatch of bulk consignments from silos in Rouen silos, the HAROPA port complex also encompasses grain loading at terminals in Limay and Bonnie`res-sur-Seine, making use of on board river-maritime units. Furthermore, river terminals at the Port of Paris undertake the loading of grain into container, which are then barged along the Seine and loaded on board ocean-going vessels in the ports of Rouen and Le Havre. Between January and June, the French Atlantic port of La Rochelle handled just over 3mt of dry bulk, of which 2.35mt was exported and 650,000 tonnes imported. Cereals, amounting to 2.32 million, the vast majority of which was exported, were by far the most important commodity. Livestock feed, at just over 100,000 tonnes, and fertilizer (just under 200,000 tonnes) were the two other notable commodities handled, the majority of which is inbound. Other industrial dry bulks generated a combined 384,000 tonnes, also mainly imported. In comparison, La Rochelle handled 2.49mt in the first half of last year, which is 20% lower than this year’s performance. Julien Durand, who heads up the port’s strategy and development projects, explains that the difference is mainly accounted for by a significant increase in export cereals. Asked to forecast what the end-of-year figure would be for dry bulk, Durand suggests the most conservative figure is in the region of 5.5mt, although it is not impossible that the port will exceed this. In respect of potential capacity constraints, he stresses that this would not be a function of the port’s handling equipment, but rather of supply and demand. Terminal operators, however, continue to invest. Leading cereals operator, SICA Atlantique, has spent heavily on improving its loading facilities and can now achieve rates of up to 1,500tph (tonnes per hour), although the machinery involved incorporates a system to reduce emissions. The second largest cereals operator, Soufflet, started construction this year of a new 63,000-tonne quayside silo, which has an engineered loading capability of 1,200tph. For imported bulk commodities, terminal operator EVA has bought a new Liebherr crane and has invested in solutions to enable it to handle big bags. Quizzed as to the port authority’s policy on promoting rail and inland waterway, Durand explains that the use of rail has gone up by 30% in the last five years. The port authority has also given further incentives to use rail, by making rail access free of charge. Furthermore, investment has been concentrated where it will produce the best return. In this respect, the Soufflet quayside silo, whose construction will commence in the autumn of 2015, is particularly important. This is, says Durand, a global logistics project and should enable the terminal operator to boost its modal share for rail to 27%. “All of this has meant that, in the first six months of this year, 23% of dry bulk cargo moved to and from the port has gone by rail or inland waterway,” he said. As for vessel size, the largest bulk carriers calling tend to be Panamax vessels in the 100,000dwt range, which is the largest the dry bulk terminals have been engineered for. However, many smaller bulk carriers call, too. “Vessel size is driven by the market and not by technical constraints,” he stressed. Finally, Durand revealed that La Rochelle port authority is doing several things to promote greater environmental protection when handling dry bulk. It has worked with one of the cereals operators to shift a loading facility further away from local residents. The port also permanently measures the air quality, which ensures it is always very high. Terminal operators are also encouraged to invest in state-of-the-art dust suppression technology. “In 2015, we joined the Environmental Shipping Index, which means we now offer significant reductions to the cleanest and most environmentally friendly ships,” he noted, additionally. The French Port of Strasbourg forms a key part in the feeder network serving various coastal ports in the Hamburg–Le Havre range. In the first half of the present year, it posted figures showing that it had handled 2.672mt of dry bulk, a 15% increase over the 2.333mt recorded in the corresponding 2014 period. Emilie Gravier, the port’s Development and Promotion Director, explains the increase on strong trade in cereals during the early part of the year and on a slight improvement in gravel exports. “For the full year, we are predicting dry bulk traffic will reach 5.265mt, as opposed to 4.926mt last year,” she said. Quizzed about capacity restraints, she pointed out that these were hard to identify, since all handling at the port is undertaken by private sector companies, all of whom are responsible for their own investment in expanding capacity when needed. example, to the half year to date, the port had exported 2.268mt of dry bulk, but imported just 393,695 tonnes. The ratio was broadly similar in the first half of last year, when equivalent figures were respectively 1.974mt and 344,691 tonnes. “We mainly handle two commodities in the dry bulk sector: gravel/construction materials and cereals,” said Gravier. Being an inland port, the port authority clearly aims to attract as much local traffic as possible either to the river or local railways. This promotion can include support to source financing for new handling capacity. “The port of Strasbourg also undertakes prospective studies aimed at shifting road traffic to rail or inland waterway,” she said, explaining that 86.76% of dry bulk traffic generated by the port is moved by inland waterway and 13.14% by rail. As for vessel size, barges can vary between 90 metres and 135 metres in length, giving a transport capacity range of between 1,650 tonnes and 4,500 tonnes. In both 2013 and 2014, the Belgian Port of Ghent was the biggest dry bulk facility in Belgium, with shipments moved to and from dedicated terminals by sea, inland waterway, road, rail and pipeline. It is among the European leaders in respect of the storage of cereals and derivatives (agribulk), with a total capacity of 1.3mt. Other bulk commodities, such as coal, ores, minerals, fertilizer, animal feed, peat, salt and sand also account for a large part of the port’s goods traffic. In 2014, while dry bulk traffic remained essentially stable, overall volume declined by 1% to around 47.7mt. Of this, ocean- going cargo, which amounted to 25.9mt, reduced by 0.25% compared to 2013. However, it was on inland waterways that the biggest decline was seen: the 21.8mt handed represented a drop of 1.8%. Despite this, around 14mt of mostly imported bulk commodities were moved from the port to their end destination by inland waterway in 2014. Nevertheless, dry bulk traffic did increase, albeit slightly, thanks to more agricultural products, ores and metal residues and scrap being handled. Indeed, dry bulk accounted for 65% of all ocean going traffic, increasing by 2.3% to 16.7mt on the year. “In the autumn, we suffered four days of strikes that blocked shipping and effectively cost traffic,” explained port company president Mathias De Clercq, who pointed out that the decrease in inland waterway traffic was linked to a drop in demand for solid mineral fuels and metallurgical products, among other commodities. He highlighted a noticeable evolution that is taking place in the port’s business mix. While short sea shipping along the European coast and around the Mediterranean again went up slightly — by 1% — and now accounts for 67.5% of ocean going cargo, the share of deep sea traffic continues to slightly decrease every year. Vessel numbers are also in decline, reflecting the growing size of bulk carriers and barge trains nowadays being deployed. There were 2,893 ocean going vessel calls in 2014, which was 55 down on 2013. On inland waterways, the 14,656 movements recorded were 494 fewer than the previous year. due to it transshipping large amounts of Russian coal (anthracite and linseed). In eighth place comes Ukraine, which trades mainly in maize, rapeseed and anthracite, while Turkey, now viewed as another emerging trading partner is ninth, with scrap, iron and steel sheets all key commodities. In tenth place is the UK, which produces consignments of iron and steel sheets. Overall, De Clercq remained optimistic regarding 2015, since new investment is slated. In particular, he pointed to the expectation that a treaty would be concluded between Flanders and the Netherlands for the realization of the new lock in Terneuzen. This is needed, he emphasized, since otherwise Ghent would be at a disadvantage going forward in that ever larger ocean going vessels can no longer reach Ghent via the existing Terneuzen lock. Indeed, vessel size is very much dictated by the lock on the river, which means that, currently, the largest vessel that can call is of 92,000dwt. However, once the new Terneuzen lock — to be known at the Nieuwe Sluis Terneuzen (New Terneuzen Lock) — opens in 2021, vessels of up to 120,000DWT will be able to call. In the first six months of this year, Groningen Seaports handled a combined 5.834mt of traffic. The port authority actually administers two different ports: Delzijl and Eemshaven. The former accounted for 2.5mt of the aforementioned traffic, while the latter posted traffic of 3.33mt. A spokesperson for the port suggested that there were no clear factors influencing changes in current traffic patterns. Interestingly, Delfzijl handles more exports than imports – 1.6mt as opposed to 0.8mt – while the situation is reversed at Eemshaven, where exports accounted for just 922,113 tonnes and imports for 2.4mt. “We do not have a end-of-year forecast as such, but we expect to end the year with volume of around 11.5mt,” a spokesperson told DCI. Current capacity, she noted, it more than enough for existing traffic. Groningen Seaports mostly imports dry bulk commodities. With minerals (mostly coal) accounting for around half of total port traffic and agribulk 6%. Other bulks handled are fertilizer (1%), ore (2%) and metals (1%). The largest vessels calling at the port tend to be bulk carriers conveying shipments of coal. These can be anything up to 240 metres in length, although size tends to be a function of draught: Delfzijl having a water depth of 9m and Eemshaven a draught of 11m. Indeed, it is the latter facility that mostly handles dry bulk, which accounts for around 69% of the overall traffic, where vessels can dock at the 1,100-metre dedicated dry bulk quay at the northern end of Julianahaven. Interestingly, the port authority is able to exploit is good inland waterway connections, with around 4,000 vessels a year serving the port via connecting canals and rivers. Rotterdam, one of the giants of the European dry bulk scene, handled 43.7mt in the first six months. Nevertheless, this was down 4.9% compared with the first six months of last year. Martin Ouwerkerk, the port authority’s Business Manager for Dry Bulk & Energy explains that this throughput was particularly influenced by a weak first quarter in respect of both iron ore and scrap, although the second quarter had been broadly similar to the corresponding 2014 quarter. “Despite two new electricity generating plants having opened in the port of Rotterdam, also coal throughput in the first half year of 2015 was a bit less compared to the first half year of 2014. This, in part, is among other factors due to the closure and maintenance of coal-fired power plants in Germany. These, additionally, now have to compete more and more with solar and wind power on the one hand, and still compete with lignite on the other,” he explained. Agribulk also posted a significant reduction in volume compared to the first half of last year, while other bulk cargo, consisting mainly of industrial minerals and construction materials, remained stable. 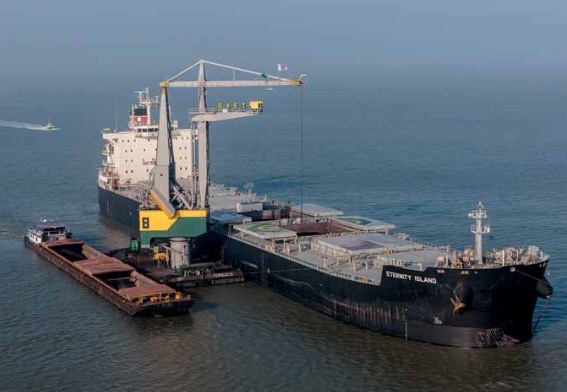 “We expect to end the year having handled around 90mt of dry bulk,” said Ouwerkerk. He pointed out that the port of Rotterdam offers all the facilities necessary for the transshipment, storage, processing and distribution of any dry bulk commodity, be it in large or small quantities. Products are handled at several terminals or directly between vessels at buoys and dolphins. “The port offers large-scale storage capacity — both open and covered — as well as value-added services, such as screening, crushing, blending or packing. Even so, both the terminal companies and the port authority are always looking for opportunities to modernize infrastructure, equipment, and/or storage capacity,” he said, emphasizing that, currently, investments are being made in buoys and dolphins, with new dolphins having been deployed in the Maasvlakte 2 area. In addition, several buoys and dolphins are being updated or modernized. At the same time, several terminals — for example EECV, EBS, BSRvanUden Stevedoring, and Marcor — either recently invested in additional storage capacity or have plans to do so. Rotterdam, serving several industrial areas, mostly imports commodities, with less than 10% of dry bulk traffic exported. A whole raft of products pass through port installations, although the main commodities are iron ore and coal, followed by industrial minerals & construction materials, agribulk, scrap and biomass. As for the types of vessels used to move dry bulk, Rotterdam’s water depth of up to 23.65 metres means that even the largest vessels can be accommodated under the right conditions. In fact, dry bulk is transported in various types of ships, including VLOCs, Handysize vessels or coasters, and also on multipurpose vessels, and everything else in between. “The choice of vessel size depends on various aspects: the type of commodity (hence its per-tonne value), the port of origin (and its conditions, such as maximum water depth), charter rates, and so on. So both draught and market conditions play a part,” said Ouwerkerk. In general, policy at Rotterdam is to promote the usage of rail or barge to transport cargo to the hinterland. The majority of dry bulk which is transported to the hinterland is already moved either by barge (approximately 80%) or rail (17%). This is part of the port authority’s overall environmental remit, with the Port of Rotterdam Authority co-operating closely with DCMR, the environmental protection agency of local and regional authorities in the Rijnmond region. This institution covers all aspects of the environmental monitoring of the port and also takes action in the case of nuisance complaints and incidents. “The Port of Rotterdam Authority is in close contact with companies that operate in the port, too, challenging them to develop their business as sustainable as possible,” said Ouwerkerk. At the Port of Hamburg at the northern most point of the range, dry bulk handling continues to form an important component of the total traffic mix. Around 43mt of dry bulk, including both suction and grab cargo, as well as additional liquid bulk, are handled there on an annual basis. For the first six months of this year, the port reported a total of 23.6mt of dry bulk, up 12.3% on the previous year. Coal and ore imports posted the most dramatic rise, of around 19%, with traffic totalling 11.5mt, which meant grab handled commodities were powering growth in this sector. Coal imports reached 3.8mt, equivalent to growth of 46.3%. Even commodities moved by pneumatic equipment showed increases. Overall, there were 5.3mt of these in the half year, an increase of 22.4% compared to the first six months of 2014. Indeed, Hamburg remains one of Europe’s top hubs for those commodities handled by pneumatic equipment, with silo storage capacity totalling more than 1mt. Vessels can berth directly in front of the large silos, where high- performance equipment assumes responsibility for loading and discharge operations. Netherlands-based Ovet Dry Bulk Terminal specializes in the storing, transshipping and processing of dry bulk. Currently, it is active at the ports of Terneuzen and Vlissingen, as well as providing lightering services on the River Scheldt, using floating cranes. According to Account & Planning Manager Sander van der Veeke, for the first half of the present year, the company handled in the region of 4.5mt (million tonnes), broadly similar to the corresponding 2014 period and very much in line with budget. “There are several main factors impacting on present traffic. Firstly, the price of both steam coal and Australian coking coal. Secondly, the general market situation, in particular, the demand for steel. Thirdly, the state of the [German] renewables market. Fourthly, the closing of older power stations in the Netherlands. And, finally, the situation in Ukraine, which is affecting the anthracite, coke and petcoke market,” explained van der Veeke. The company is therefore predicting end-of-year volume to reach a little over 9mt, which is again broadly similar to 2014. Asked about customers, he explains that it is the steel industry that is the biggest off-taker of Ovet’s handling services for commodities, such as coal, cokes and anthracite. However, for the past ten years, Ovet has also been trying to establish a presence in the biomass market. In 2005, this business generated 500,000 tonnes of traffic, only to be in decline ever since. In 2009, Ovet began storing wood pellets in a custom designed warehouse. Nevertheless, currently, other products are being sought that can also be stored there. Ovet has also found ways to tap into other revenue sources, offering a wide range of value added services, such as crushing, blending, screening and compacting. Explaining why, van der Veeke points out that the company has built its reputation on the provision of high quality standards, but is otherwise very much a niche-market player. “In the types of market that we operate, customers are looking for screening and crushing facilities in order to get the right size of product, which is mainly used as a fuel for industrial applications. Furthermore, being able to offer excellent compacting services is a necessity if long-term storage is involved. As for blending, this can be of interest to traders who want to play with margins, which often involved offering custom- made blends and qualities,” he said. Ovet also offers a de-ironing option, although this is only used in the case of Russian coal and is therefore requested only by certain customers. Ovet is unique, too, in only operating floating cranes, despite having two land-based terminals. There is one exception: a small, mobile harbour crane is used to handle coasters and barges. Asked why the company has taken this approach, van der Veeke points out that floating cranes are much more mobile and flexible than quay-based lifting equipment. In fact, he identified the lightering operations on the Scheldt as perhaps the most important services that Ovet offers. These involve reducing the on board cargo of Panamax bulk carriers so that they can continue up-river to the Port of Ghent, with the excess transferred to coasters or (push) barges. “The canal from Terneuzen to Ghent has a draught of 12.5 metres of fresh water, which is not enough to accommodate a full Panamax vessel loaded with coal and/or iron ore,” he said, adding that, this year, this service is expanding in line with changes to the sea freight market. Finally, challenged to identify from where Ovet sees the majority of its growth coming from in the future, van der Veeke is in no doubt: from its added-value activities in the niche markets where it has staked an important presence.